The plateau of Monte Piana is not so astonishing like the panorama you have in front in the area of Tre Cime di Lavaredo or Monte Cristallo, but represents for sure a nice, quite easy and above all instructive day (even half day) itinerary in a small area around the peak of Monte Piana. This mountain of the Sexten Dolomites range was the scenario of a slow massacre in World War One years. The area overlaps with the former 1753 frontier between the Republic of Venice (Serenissima) and Tyrol (a boundary stone is still visible on site). Immediately after the war outbreak, early June of 1915, the troops of Standschützen tried to gain the summit around the Piramide Carducci: heavy casualties on both sides and fundamentally a stationary front line for the remaining 30 months were the results of the war in this plateau of the Dolomites. One of the main targets of the Austrian attacks was the area of the Forcella dei Castrati, that is a kind of landmark of this short itinerary, a depression in this gibbous plateau where you can admire magnificent florescences. 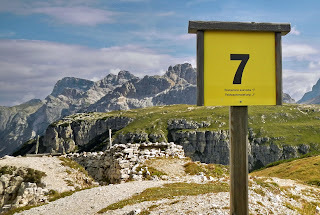 In 1977 the Dolomitenfreunde, a group of volunteers headed by Walther Schaumann, restored the trenches and the former positions of the two fronts and the resulting path is now a really instructive and easy itinerary with breathtaking views appearing on each side. As always, even the easiest walk can turn into something dangerous, therefore we invite you to keep the highest level of attention, with particular regards to the steep and rocky side looking at Landro valley (some parts of the itinerary are equipped with special steel ropes and a set of harnesses is recommended). The starting point is Rifugio Bosi (Tel. +39 0435 39034, email: rifugiomontepiana@tiscali.it, here on Maps) that you can reach also from Misurina with a special jeep service (in summer) or snowcat service (in winter). Of course you can reach the hut by foot from Misurina and it’s going to take between one hour and one hour and a half. 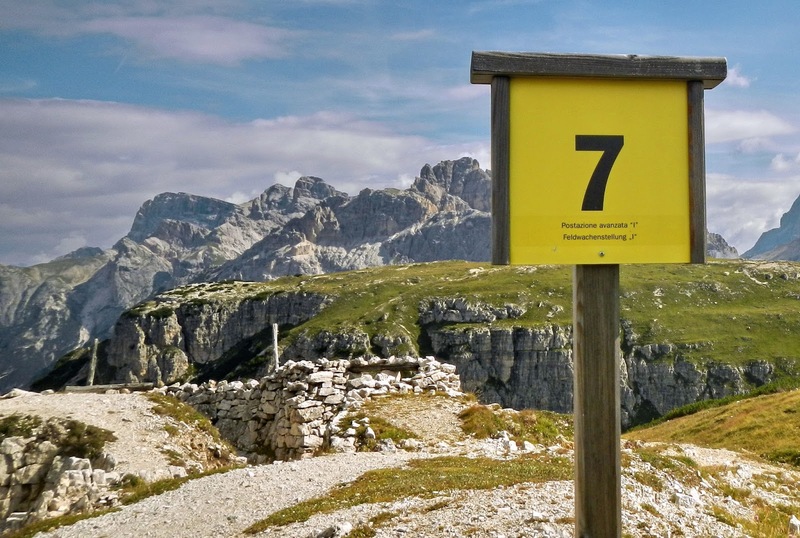 From the Bosi mountain hut you can easily reach the historical path (look always for the yellow signs and follow path no. 6a). Like we already wrote, pay particular attention to the most exposed segments of the path that lead you among Italian positions and then to the very large summit of Monte Piana (2324 m. above see level, 7625 ft) . You can proceed toward the centre of its plateau through the Italian trenches and wire fences touching in a rapid sequence the aforementioned Piramide Carducci and the Forcella dei Castrati, the Italian stronghold. 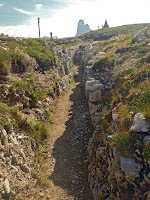 Follow the path 111 and the “Cengia della Guardia Napoleone” with some exposed parts and partially equipped with steel ropes and you will see the two galleries of mines. Once you're come back on the plateau you’re in the Austro-Hungarian positions. At this point you may reach the “Dobbiaco Cross” and the beginning of the “Pionierweg” (a steep path ascending from the Lake of Landro) where you can have a good overview of the surrounding area. 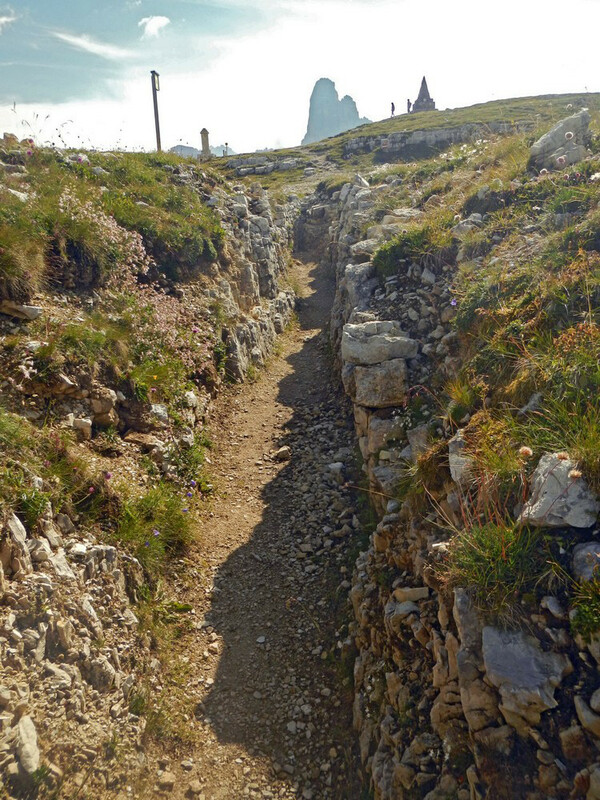 The way back is a descent through the Austro-Hungarian trenches that touches again Forcella dei Castrati and Piramide Carducci and bring you you back to the Rifugio Bosi. Suggested map: Tabacco no. 10, Sextener Dolomiten/Dolomiti di Sesto, 1:25.000, here a brochure in English, Italian and German.